Wear A Mask While Soldering? Hi! I've heard here and there that some people recommend wearing a mask during soldering as a precaution for the fumes. When I go look at them at the hardware store, they say "not for lead". I just want to 'play with broken glass' safely. The only fumes you would get from soldering is from the flux. Lead fumes are only present if you heat the lead hot enough to vaporize it, and that will never happen with soldering. Just a plain old good ventilation system is the best precaution. Something that draws the fumes away from you, and out of your workshop is preferred. As an example, a range hood mounted over the table, vented to the outside is an ideal system. You can come up with a system for just about any scenario you can think of as a work area. Just takes a little imagination some times. I am sure you can post your description of the area you do your soldering in, and some one will come up with a perfect system for you. I have a workshop set up outside. It is open on all sides. Since I live in 'sunny California' I don't have to worry too much about the weather. Thanks again for the lead info I've been trying to figure that out for a while. Soft soldering and painting are two different animals. Glass and Ceramics paints can give off toxic fumes on their own. In just soft soldering, such as in stained glass, the heat required to vaporize or create "Lead" fumes, is not attained, so the hazzard from "lead" fumes, is not an issue, according to any scientific studies and safety sheets,I have read. Working with "Pottery" can produce lead fumes, if the glazes have lead in them, and because of the temperatures reacched. An "Air Scrubber" is only used where very toxic fumes are encountered, such as in chrome plating, and other applications that produce acid gases or heavy metal fumes. Its OVERKILL for a stained glass operation of any kind. A "dust" mask is a good idea for working with lead where any sanding or grinding is done, as with a dremel, or even a came saw. Particles will become airborne, and can be inhaled. They will also settle on your benches, tables, floors, stick to your shoes and clothes, to be carried around your whole living space, so keep that in mind. Never use a vacum to clean areas like this, unless your vac vents ourdoors, since all you do is make the particles airborne again. If you vent outside, it does not hurt to have a filter bag on the exhaust, to catch most of the particles. One should always keep working safely in mind, since we do have a hobby where accidents can be serious, and negligence can be disasterous. We also have to keep in mind that being safe, and following the work rules for the materials we use, does not require the restrictions that one would need using "Lethal" materials or chemicals. This is about what you will find in almost all scientific studies and health studies. Assessment-Soft Soldering with Tin/Lead Alloy Solders. Fluxes used during the soldering process produce fumes during decomposition such as Lead, Ammonium Chloride and Zinc Chloride. These are harmful, corrosive and irritant and rosin or colophony fluxes in particular can cause sensitisation. Respiratory sensitisation means that once a person is “sensitised” to a substance, thereafter the slightest exposure to that substance may bring on an Asthma attack. Lead fumes are not generated significantly at temperature below 500°c. Soft solders melt at 300°c and therefore the risk from lead fumes is negligible. The fumes of ammonium chloride (OES 20mg/m3) and of zinc chloride (OES 2mg/m3) will not reach these 15 minute reference values in a school metalwork area. The fumes from the decomposition of rosin fluxes contain formaldehyde (methanol) and have OES values of 0.05 mg/m3 (8 hour TWA) and 0.15 mg/m3 (15 min ref period). Whilst these levels will not be reached in a metal work area housing many different activities, they could be reached in an electronics room or area. Fumes from heating any flux may irritate the eyes and respiratory system at high concentrations. Since many persons in schools are now recognised asthmatics, rosin-based fluxes should be replaced with newer types such as Multicore Ecosol 105 or Omega. Lead particles will remain the biggest threat to lead getting into our systems. From Restorations, to using a came saw, or dremel, as I mentioned , or even using whiting to scrub lead windows or panels, and breathing the particles. If you see "dust" in your workshop, it can and likelty will contain some lead. Keep that in mind. [attachment=310:pks_stor...67644872.gif]Lead came is not the most dangerous lead in your shop.You will get some lead from eating or smoking in the studio while you are working with lead came. The real danger comes from lead dust created by sanding or polishing came with whiting or activities which create lead fumes such as soldering. Fumes from soldering are the most subtle and therefore the most ignored dangerous to get lead exposure. When you solder a small amount of the lead will disperse into the air as fumes which can be easily and unconsciously inhaled. The fumes settle through out the studio and can be stirred up when sweeping or just walking around the studio and breathed by the workers and in the case of a you're home studio "your family". Fumes from soldering are the most subtle and therefore the most ignored dangerous to get lead exposure. When you solder a small amount of the lead will disperse into the air as fumes which can be easily and unconsciously inhaled. The fumes settle through out the studio and can be stirred up when sweeping or just walking around the studio and breathed by the workers and in the case of a home studio your family. Most fluxes contain zinc chloride that is harmful to the skin and eyes, and toxic if ingested. Well-ventilated means MOVE THE AIR - DON'T JUST OPEN A WINDOW. since you're outside, you are well vetilated! but buy a small clipon fan, turn it on high, point it away from you to reduce fume intake. There are small, portable fume removers made specifically for eliminating flux fumes, available through your local stained glass retailer. If you find that you are getting frequent headaches or sinus problems, you may be breathing fumes. One rule of thumb - if you can smell what you're working on, you probably need to move the air a bit more, or invest in a fume remover. 3M 6000 series halfmask respirator with 2091 P100 filters is the cheapest way to go. around $20.00. A $30 respirator will NOT remove flux fumes. Even a $200 fume trap will NOT remove the vapourized flux particles. If your goal is to avoid inhaling the fumes from vapourized flux, you have 2 options. Either invest about $10,000 on equipment or vent the fumes ENTIRELY out of your work area. This will disperse the flux fumes into the outside air but will NOT distribute any lead. Lead does NOT form fumes at the temperatures stained glass artisans work at. When setting up an exhaust system, do NOT use a fan to push air. Instead, use the fan only to pull air away from you. A large fan moving slowly works better then a small fan moving quickly. The objective is NOT to move a large volume of air but to control the air movement so that it moves only in a steady flow - away from you. For one, I never said a halfmask respirator will remove vapors/fumes. It’s an extra protection she can take with a good mask and proper filters, designed specificly for lead dust as well as lead fumes. Read the specifications for yourself! Most crafters are not going to invest the money to set up an exhaust system. And most high end stained glass studios don’t have exhaust hoods either. I said one could invest in a small fume remover. Not take out a mortgage on there home to do so. Ten grand? That’s a bit excessive there. Sounds like sarcastic overkill to me sir! My response was to the question that “KW” had regarding her workspace, and if she should wear a mask. If you read it again, you will see she has a workshop set up outside and its open on all four sides. There is no need for an exhaust system outside. A simple fan will work just fine in her situation. YES, lead and tin ARE in fumes from soldering! They are minimal, but they are there! If you don’t believe me, read it for yourself. There are more options to dealing with flux fumes than just the two you mentioned. Option 18. 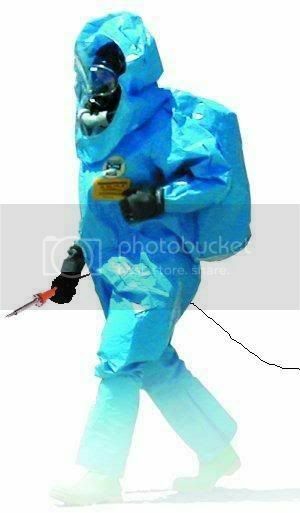 This is a photo of me walking over to solder off my toxic window. it a joke! I acctualy use scuba gear! I use a "Survivair" half face respirator, that does extract flux fumes, rosin core fumes, and any other solder related fumes. It uses two replaceable and selectable cartridges, depending on application, and will remove anything from organic vapors to acid gas. NIOSHA approved and tested. I also use through the wall ventilation, drawing fumes out of the shop. The chemicals in flux where invented long before stained glass enthusiast discovered them, and protection against such, had been long before developed for industrial use. "Flux" chemicals are not a "new" discovery. Good respirators, equipped to your requirements, do work. If you use the right cartridge, you get the right results. If you want the "real deal" on hazards of the hobby or profession you have chosen, don't depend on your local glass shop to provide you with accurate laboratory information and advice that they have heard from Joe, down at the glass warehouse, or Bills web page on Stained Glass. Go to the places that actually set the standards and do the research. That knowledge, if put to use, will minimize your risks. There is no "Total" protection against any fumes or dusts, lead, glass, or just plain dirt. Your going to get some, no matter what you do, short of working in a "white room" with air locks and a self contained sterile atmosphere. The key is to avoid what you can,using what you know, and plain common sense. What about the Inland "Fume Trap" which is based on carbon filtering. The specs. are listed on the Inland site. "Developing the FumeTrapâ„¢ meant selecting the right filter material was crucial to producing an effective product. Removing the gas and vapors generated during the soldering process involved removing particles .01 microns (.000000393 inches) and smaller. After much research and testing, it was evident that activated carbon filters were the best choice as an effective material for this application. Removing gases and vapors involves capturing particles .01 microns and smaller. A micron is 1/25,400 of an inch. Particulate filters, like HEPA filters are effective into the .3 micron range. They can not and do not remove material that is as small as a gas. Activated carbon uses the process of ADSORPTION to remove gases and vapors from the air stream. The question often asked is what is the difference between ADSORPTION and ABSORPTION. ADSORPTION is the physical attraction and adherence of gas or liquid (vapor) molecules to the surface of a solid. Gas and vapor molecules are adsorbed by the solid activated carbon. ABSORPTION is the dissolving and even mixing of a substance in a liquid. Think of sugar being mixed into coffee. In an industrial application the gas is absorbed by a "scrubbing" liquid. Why is activated carbon a good adsorbent? It has the ability to adsorb some of almost any vapor. It has a large capacity for organic molecules, especially solvents. It adsorbs and retains a wide variety of chemicals at the same time. It works well under a wide range of temperatures and humidity levels. It is inert and safe to handle and use. It is readily available and affordable. It is a material that has been treated, or activated, to increase the internal surface area to the range of 950 to 1150 square meters per gram. The internal surface area is what holds the adsorbed gases and vapors. It is where the "work" of the filter is done. The term activated charcoal is often used interchangeably with activated carbon. They refer to the same material. The Non-technical Explanation: It starts with the gas molecule coming in contact with the surface of an activated carbon particle. The gas molecule comes to rest in a large surface pore on the particle. Unbalanced forces on and within the carbon particle cause the gas molecule to move down into the smaller pores of the carbon particle where it will stop and be held in place. At some point the gas molecule will condense and become a liquid particle, trapped inside the carbon. The Technical Explanation: The adsorbate (gas) diffuses through the surface film of macropore structure (activated carbon). Van der Walls' forces cause the gas to migrate into the micropore structure, condensing during this movement. It stops when either the forces become balanced or it is physically blocked. What types of gases and vapors are adsorbed? Activated carbon is the universal adsorbent and will adsorb "some of almost any vapor". Below is a partial list of gases that are removed by activated carbon filter systems. James W. Kasmark Jr.; B.S. Mechanical Engineering; President D-MARK; "Activated Carbon" Why is it used?, ©2000, D-Mark Inc. Boy, this topic is very interesting to me because I've been wondering for awhile if I'm ventilating properly and enough so that I'm not "ingesting" toxins. I work in my garage and always leave the garage door open. The way I work is with the garage door on my left and I put a tall standing fan on my right so that it blows towards the open garage door. From what I'm reading, it doesn't sound like that's enough. I've also been wondering if holding lead came with my bare hands is harmful since things that get into your pores can eventually get into your blood stream (so I've heard). Does anyone know anything about this? I've tried wearing gloves, but it's so hard to work with gloves on that I finally discarded them. I guess I could put surgical tape on my fingers...but it still makes it hard to work with the came. Oh, and one last thing...(maybe)...It's been some time ago that I did a stained glass in lead came instead of copper foil. I've forgotten what the substance is called that you push into the came at the end after soldering to fill up all the holes. Is it just unsanded grout? Dennis has posted this link a couple of times, since its a frequent subject. It covers the lead question pretty well. A very good idea for vacuuming is to get a longer suction hose, and leave your vacuum outside, like I do. You can have any kind of filtering you like, but they all will leak some, sooner or later, and blow that dust right back in the room for you to breath. I am sure there are those who will swear by their vacuum and say it will not leak, and thats great too. Each to their own. Just my opinion anyway, having owned about 20 vacs or more. When building our new home my husband insisted on installing a Island Range Hood over my work table for soldering. They are inexpensive if you can find them on sale, we got mine for under $250 and had it installed when we were building. I don't think it would cost too much more to hire an electrician to install one in an already built home. Playing with glass has and always will be my happy place. When the studio is all up and ready for glass work to begin I will post some pictures. Oh and we also installed a whole house Vac (grin). My new shop i.e. studio is 33'x14' The biggest and best of all my other shops from moving throughout the years, and after 27years playing with glass we both thought is was about time.